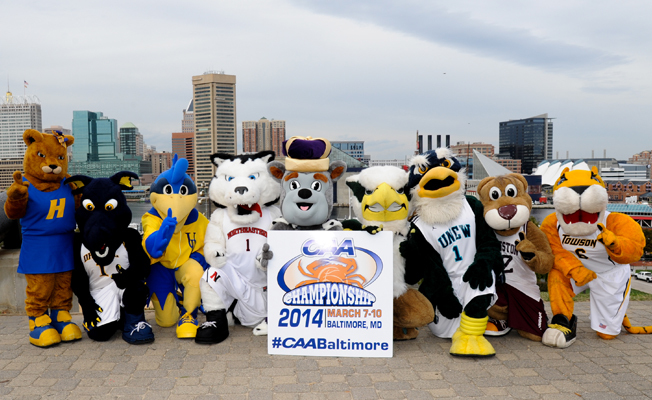 I taught nine-year-olds for two years coming out of grad school, and believe me, those kids had nothing on the nine mascots that took part in our recent CAA Basketball Mascot Tour in Baltimore. 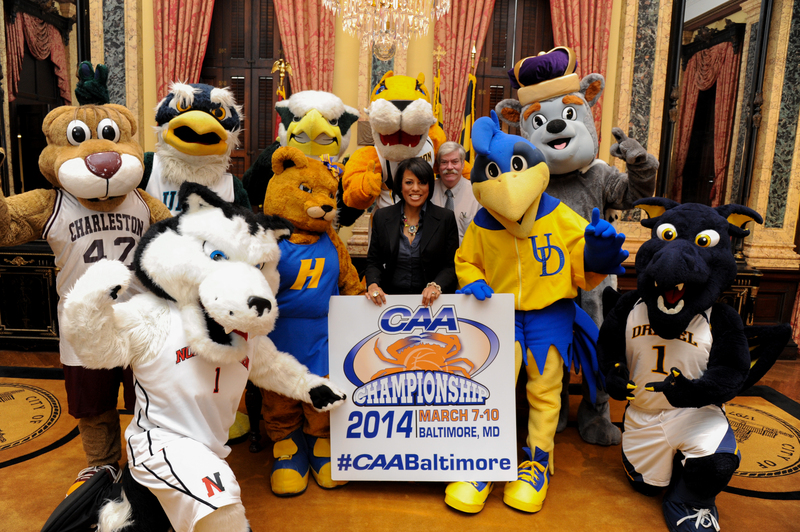 The purpose of the tour was to help promote the CAA Men’s Basketball Championship’s move to Baltimore in 2014. I was tasked with manning the conference’s social media efforts during the tour alongside several members of a local public relations team helping lead the day’s events. 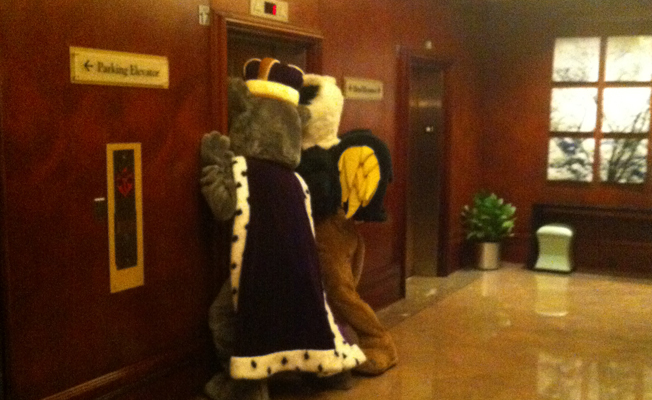 Needless to say, given the efforts (and antics) of our nine so-called furry friends, I think we got the word out. 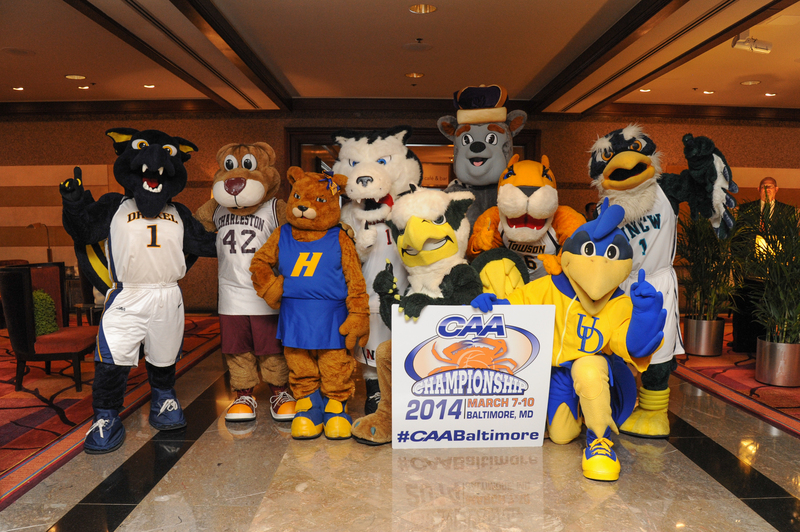 The tour began at the Renaissance Harborplace Hotel, site of our CAA Basketball Media Day. 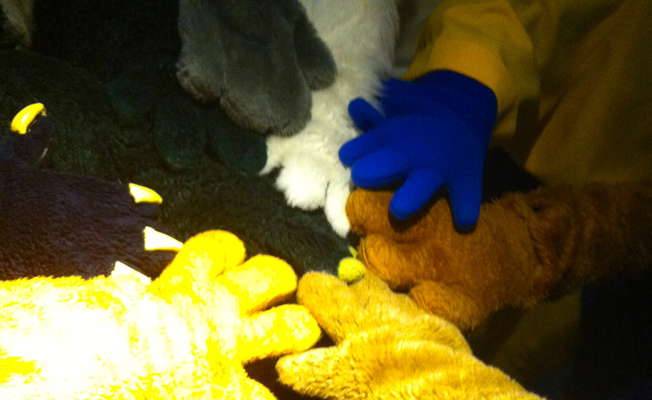 Several mascots arrived earlier than the others, so while we waited, the mascots wasted little time finding their form, greeting (i.e. scaring the hell out of) guests as they got off elevators, getting spanked by security and even taking some time to check in folks at the front desk. 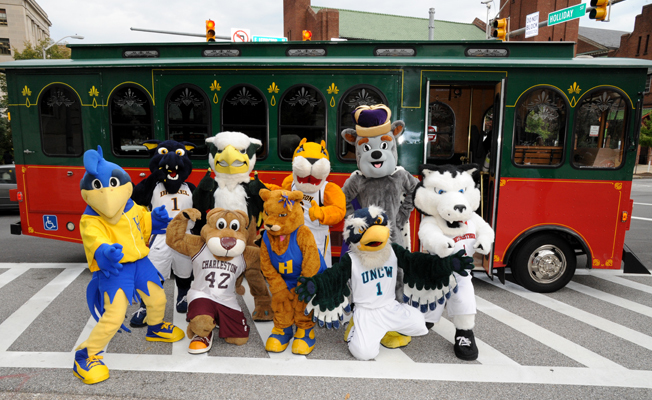 Before heading out to our first stop, we corralled our cast of characters for a photo. The expression “herding cats” certainly applied here. They are a good-looking bunch, though, right? Waiting outside for us was Baltimore Trolley, which so graciously carted the group around for the day. There was plenty of room for the gang, including James Madison’s Duke Dog, who if it weren’t for his lack of opposable thumbs could probably start for JMU given that he’s a good 6’6″. 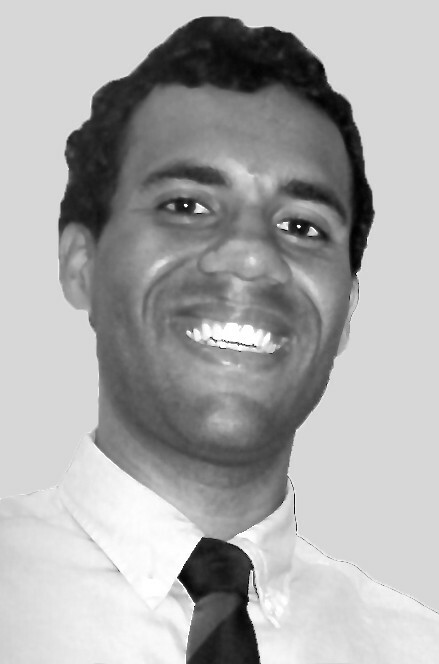 It was then off to Baltimore Mayor Stephanie Rawlings-Blake’s office. 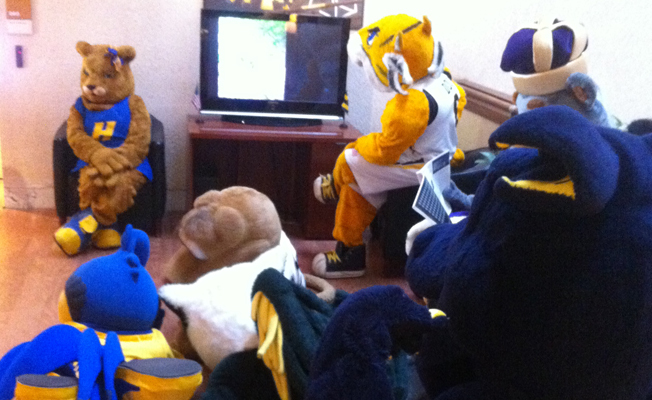 While we waited for the mayor to return from some important business, the mascots rested up and took in a little TV. We were then led into an immaculate chamber featuring artwork and furniture that had to be well over 100 years old. 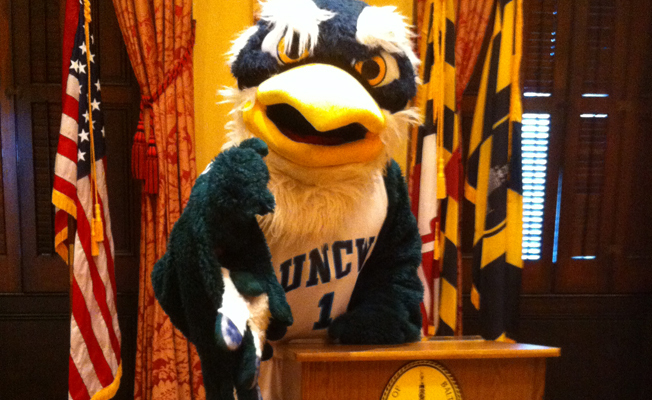 The mascots took full (and I do mean full) advantage of the space, with each taking a turn behind the podium, including Sammy, who’s got the whole politician thing down. Mayor Rawlings-Blake arrived to quite a sight. 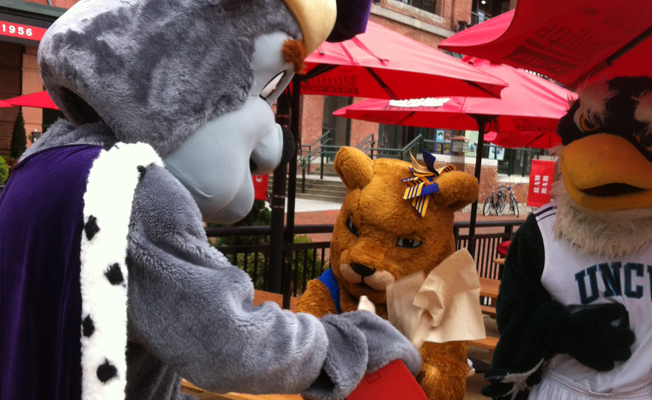 After taking in the fur-filled scene and a little one-on-one time with the league’s lone female mascot, Hofstra’s Kate the Lioness (who had just finished dolling herself up in the 19th-century mirror), it was time for what was the day’s premier photo opp. 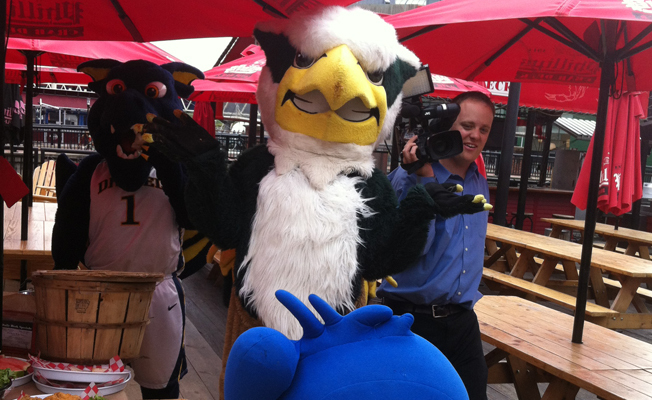 Following a quick return trip to the hotel to greet the media and their head coaches, the mascots joined us at Phillip’s Seafood in the heart of the Inner Harbor. A full spread had been set out for us, and it didn’t take long for the mascots to begin cracking crabs and making a complete mess. 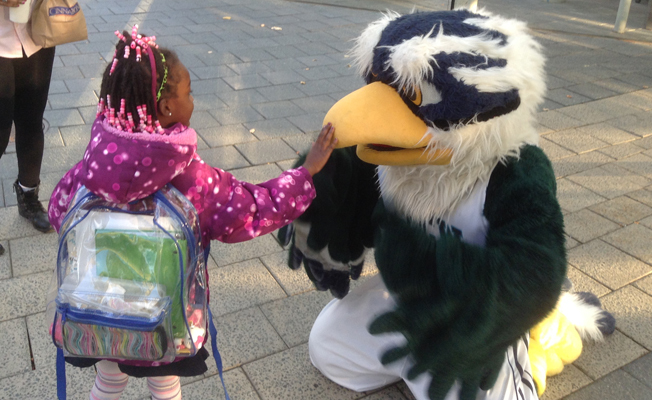 Even William & Mary’s Griffin was at a loss at the spectacle. At least Kate was there to help clean everyone up. With everyone now stuffed full of seafood, we headed to Federal Hill. 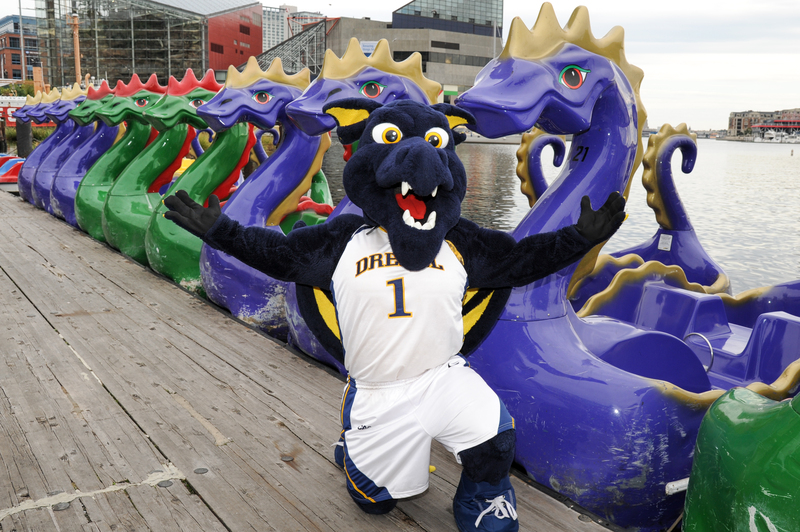 Along the way, Drexel’s Mario the Magnificent stumbled upon some long-lost family members. 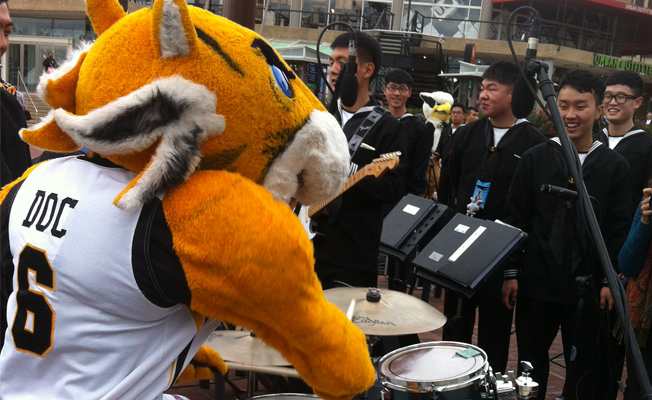 We also discovered that Towson’s Doc the Tiger has some mad skills on the drums. We thought he was just cattin’ around when he first sat down, so this was a pleasant surprise to all of us and the other Inner Harbor visitors who gathered around for the impromptu show. A beautiful view of the city awaited us atop Federal Hill, making the hike up the several flights of stairs very worthwhile. 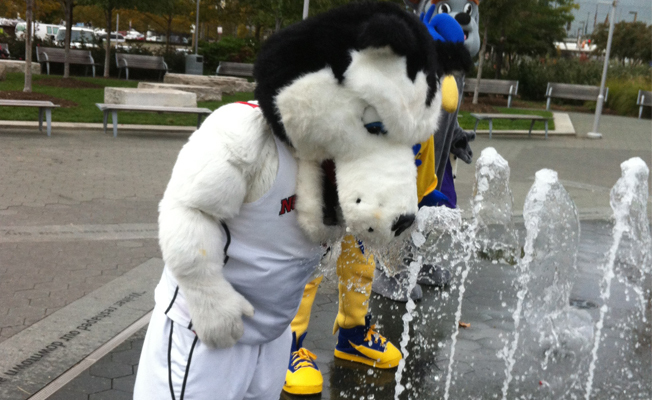 It was important that we all stayed hydrated after that climb, as Northeastern’s Paws the Husky took to heart. 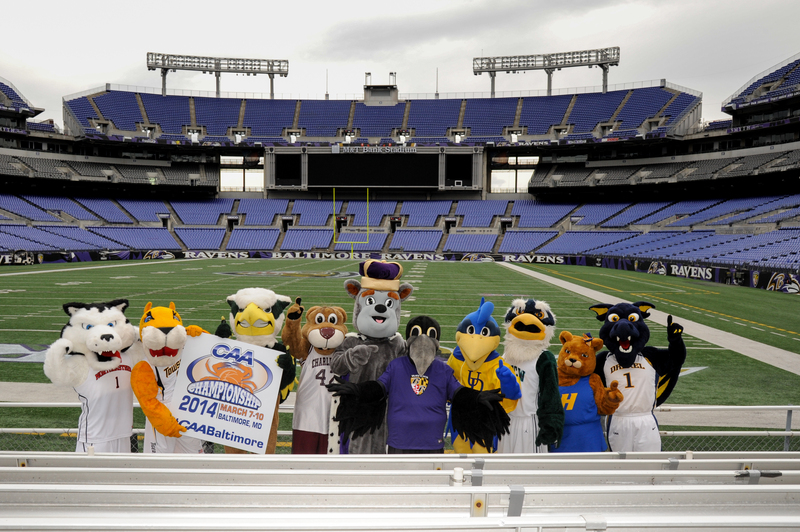 The next stop on the tour was a highly anticipated one – M&T Bank Stadium, where the reigning Super Bowl Champion Ravens’ mascot, Poe, joined us for a shot in the stands. 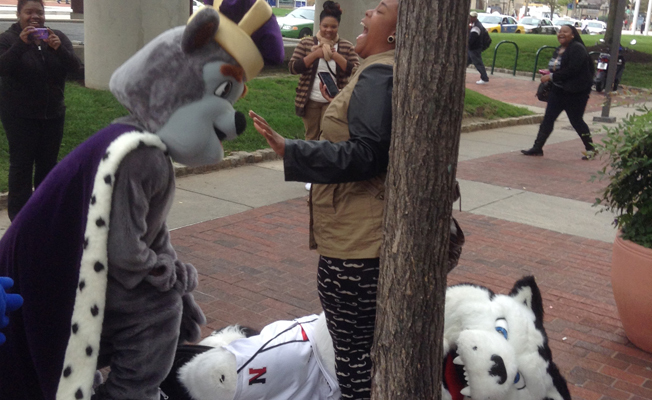 Love or hate the Ravens, they boast one of football’s cleverest mascots. We followed up our trip to the stadium with a visit to the Orioles’ historic Camden Yards, which combines classic ballpark beauty and an updated modern feel to create a great stadium aesthetic. 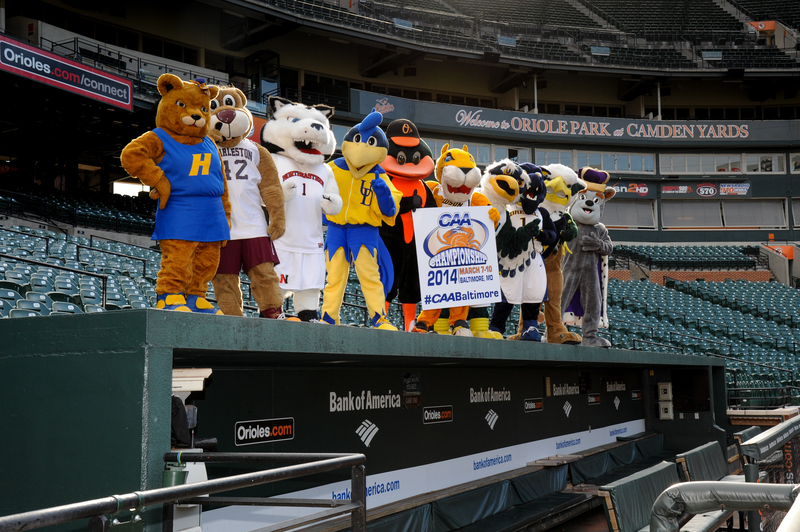 Enough about architecture, though, as we were joined by The Bird, who led our nine mascots onto the dugout for this sweet shot. 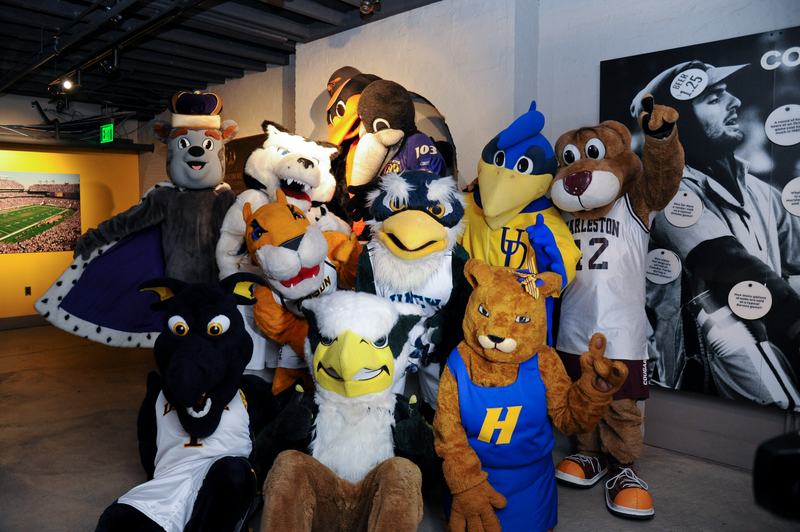 A few of us got left behind (not because we were perfecting our dugout dances), so the mascots enjoyed some extra time at Baltimore’s Sports Legends Museum. 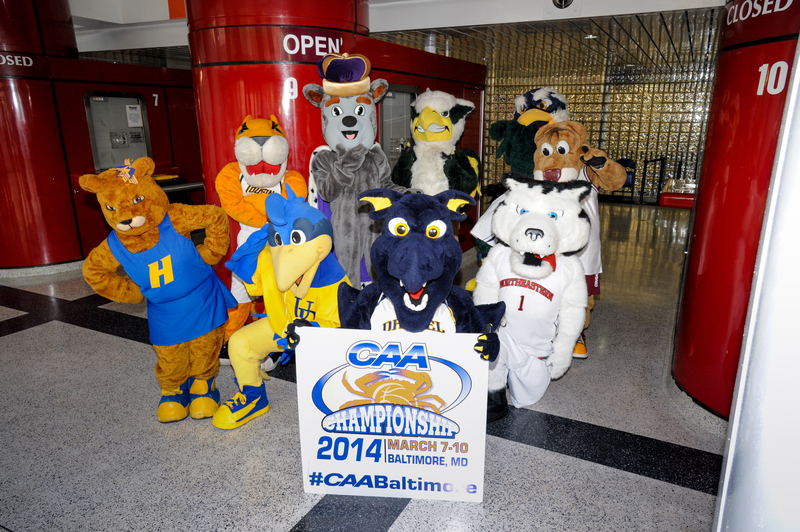 The four of us stragglers quickly caught up with the group and we then set off for Baltimore Arena, home of the 2014 CAA Men’s Basketball Championship. The league hopes to see plenty of fans in these lines come March. 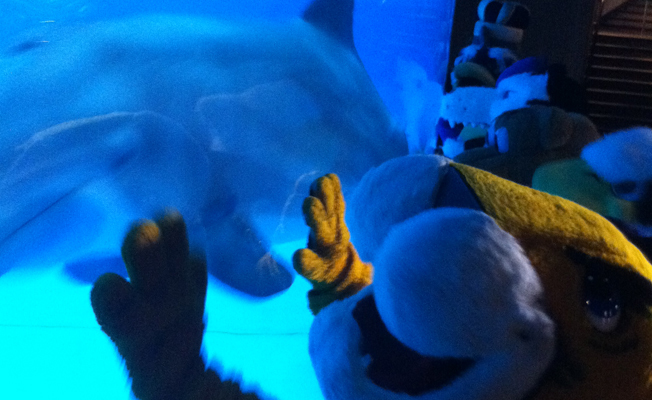 Our last stop on the tour was the National Aquarium, where the mascots made friends with one of the dolphins. 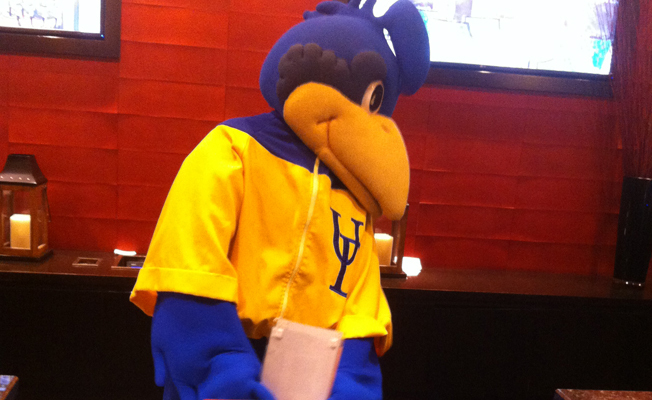 Sammy made a friend on the way out as well. Yeah, this is pretty adorable. Posted on November 8, 2013 by Zach Burrus. 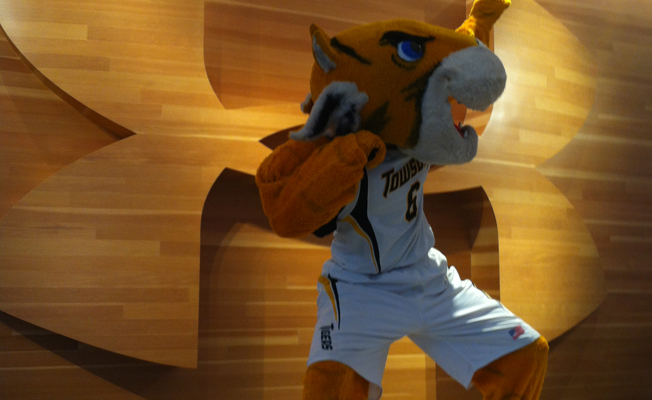 This entry was posted in Posts and tagged Basketball, Humor, Photos, Public Relations, Social Media, Sports, Travels, Work. Bookmark the permalink.